Armenia has blocked Pakistan from becoming an observer in the Collective Security Treaty Organization's parliamentary wing, the latest in a series of signs that Yerevan seeks to take a more assertive role in the Russia-led organization. 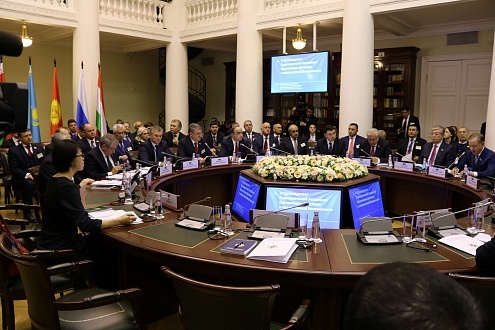 The CSTO Parliamentary Assembly is an association of mostly rubber-stamp parliaments to an organization that is mostly a shell of an alliance, so it doesn't often offer much drama. But last week saw some rare conflict in the CSTO PA as it met for a session in St Petersburg. During the event, Armenia's representative submitted a formal letter opposing a proposal to allow Pakistan to join as an observer. As a result the question was removed from the agenda, the Armenian representative, Eduard Sharmazanov, told Sputnik Armenia. Armenia and Pakistan have a long-standing dispute: Pakistan not only supports Azerbaijan in its conflict with Armenia over Nagorno Karabakh, but goes so far as refusing to recognize Armenia's existence until it gives Karabakh back to Azerbaijan. "This position contradicts the approach both of the Minsk Group of the Organization for Security and Cooperation in Europe, as well as of the CSTO," Sharmazanov said. The episode seems to have been little covered in the media, and no comment from Pakistan or from any other CSTO member was reported. Pakistani media reported on the speech given by Pakistan's envoy to the event, National Assembly Speaker Sardar Ayaz Sadiq, but did not mention the issue of Pakistan's observer status. China, India, Iran, and Mongolia also appear to have been invited as CSTO PA observers, along with Pakistan. (Afghanistan and Serbia are already observers.) Pakistan is set to join the Shanghai Cooperation Organization as a full member; the SCO and CSTO share several of the same members, but Armenia is not in the SCO. This all takes place as the CSTO continues to search for a new secretary general, who is supposed to be an Armenian, to take over from the current head Nikolay Bordyuzha. But other CSTO member states appear to have blocked Yerevan's earlier proposals for unclear reasons. And Armenia has been vocally complaining about the failure of some CSTO members -- particularly Kazakhstan and Kyrgyzstan -- for supporting their Muslim, Turkic ally Azerbaijan over their treaty ally Armenia. Will Armenia's eventual chairmanship of the CSTO have any effect over all this? It'll be interesting to see.